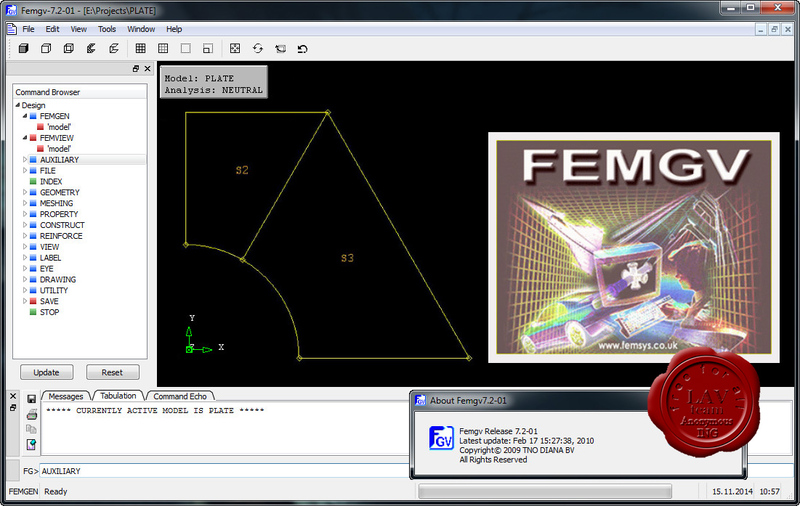 FEMGV is a general purpose pre- and post-processor for Finite Element Analysis (FEA) and Computational Fluid Dynamics (CFD) analysis software. A world-wide user-community relies on FEMGV for different reasons such as its robust, fast visualisation of extremely large models, customizable, it offers interfaces to a wide range of solvers and CAD-programs and because it is one of the very few full graphical programs that runs under Linux and UNIX. The program offers a wide range of import capabilities for externally defined CAD models as well as an extensive range of functions and tools for defining your own geometry of a model. Properties such as material-models, boundary conditions, loadings and meshing divisions are defined for the geometrical entities. Both 2D and 3D structured and unstructured mesh-generators are offered for line, surface elements and volume-elements of the first, second or third order. The user can define his own properties and interfaces to FEA- and CFD-programs. Also predefined interfaces and property forms related to standard solvers such as ANSYS, ABAQUS, DIANA, NASTRAN are offered. FEMGV can be run both in batch mode as in graphical mode. Results can be projected on the mesh by contour-plots, deformed shapes, vector plots, diagram-plots, symbols or as a graph over load steps of a graph of a result over a line through the model. Cross-section plots and a montage function for pictures are available as well as a function to tabulate results. So if you are looking for a powerful pre-post processor for your specific analysis program that can interface with different solvers, that is robust and capable in handling really big models efficiently, then FEMGV should be your choice!